UPDATE 11:00AM: The Queensland Fire and Emergency Service have confirmed the bushfire burning near Little Mountain at Caloundra is now contained and safe. A spokesperson from the service said there is still some concern with winds expected to pick up again later today. They said crews will remain on scene as a precautionary measure and monitor the area throughout the day. Smoke is likely to remain as the fire continues to smoulder. Residents who are being affected by smoke are advised to close windows and doors and keep medications close by if suffering from a respiratory condition. If residents are concerned their property is under threat they should contact Triple Zero (000) immediately. UPDATE 3.45PM: Multiple fire crews remain on scene at a large bushfire burning near Little Mountain at Caloundra. The Queensland Fire and Emergency Service have confirmed in an update at 3.30pm the fire is now contained and there is no threat to property at this time. Firefighters will continue to work in the area to strengthen containment lines and fire breaks, and the fire will be monitored overnight. Smoke will continue to affect the Little Mountain, Caloundra West and Bellvista area. EARLIER: THE threat of a massive fire burning near Caloundra has eased with fire crews now focusing on working to strengthen containment lines. In an update at 12.30pm, the Queensland Fire and Emergency Service said there were no current threat to property despite the extremely strong winds. "Firefighters will continue to monitor conditions throughout the afternoon and ask that residents remain vigilant and up-to-date with information. Earlier today, firefighters had issued a 'Watch and Act' warning that conditions were changing and residents should activate their bushfire survival plan. While the fire threat has weakened, authorities said a significant smoke haze continues to affect the area and surrounds. A 3000-litre capacity Bell 214B helicopter has been called in to help fight the blaze currently burning towards Caloundra's Corbould Park Racecourse. 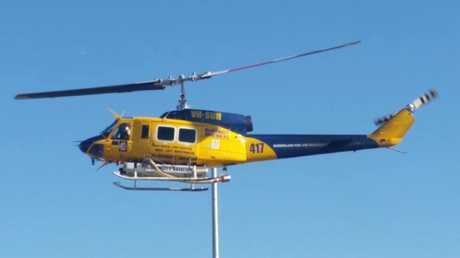 The McDermott Aviation chopper has been called in to help as a fresh alert has been issued warning the blaze, fuelled by gusty winds, is set to impact the racetrack, Caloundra Rd and Racecourse Rd. The Sunshine Coast Local Disaster Management Group has also moved to alert, as the blaze threatens to break containment lines. McDermott Aviation's Simon McDermott said was proven to be "the most effective fire asset in the country". Just before midday, the ABC posted a video showing horses being evacuated from the Corbould Park race course as the fire loomed closer. About 100 residents, including some from a nursing home, had to leave their homes on Friday night as the huge grass fire erupted at Bellvista and Aura, near Caloundra. While residents were allowed back home just after 10pm, the hot dry winds today threatens to escalate the fire - one of two which has kept firefighters flat out in the region. Firefighters were also battling a blaze near Yandina Creek on Friday night. At 10.15am, Queensland Fire and Emergency Services issued a 'watch and act' for Little Mountain (Bellvista)." Queensland Fire and Emergency Services (QFES) is advising residents in the vicinity of Little Mountain to finalise their bushfire plans. "At 10.15am Saturday 19 August, a large bushfire was located in the vicinity of Little Mountain. "The large, fast moving fire is travelling in a south-west to north-easterly direction and is expected to impact the western side of Racecourse Road, the southern side of Caloundra Road and Corbould Racecourse within the next two hours. "Residents are advised that if their plan is to relocate or they do not have a plan then they are advised to relocate now. "Leaving well ahead of a fire is the safest option for survival. "Well prepared and defended homes can offer safety during the fire and may be dependable. "Currently, multiple fire crews are working with aerial reconnaissance to contain the blaze but firefighters will not be able to protect every affected property and residents should not expect a firefighter at their door. Lake Kawana Community Centre will be open should residents require a neighbourhood safe place. Just before 11am, the Sunshine Coast Local Disaster Management Group said it moved to alert status as fires continue to burn. "The smoke is expected to remain in the Caloundra area throughout the day and affected residents are advised to take precautionary actions to minimise their exposure to smoke, particularly if susceptible to respiratory conditions. Council's waste facility at Caloundra will be closed for the remainder of the day due to the prevailing conditions. The Sippy Creek Pound is open for any pets or animals requiring shelter. The community is asked to avoid the fire affected area to allow emergency services crews the best possible access. 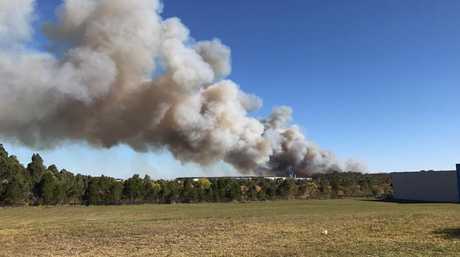 The ABC reported that 700 hectares of grassland already chewed through since the fire broke out Friday afternoon. Jeff Harper from Queensland Fire and Emergency Service told the ABC back burning is underway ahead of forecast wind gusts of up to 70 kilometres per hour. He said more evacuations are possible and there is a real risk of spot fires. "It all depends on the wind direction and how far the embers fly - they can travel quite a considerable distance. UPDATE 7.35AM: MULTIPLE fire crews have brought the large grass fire burning in the vicinity of Bellvista and Little Mountain at Caloundra under control. Currently, firefighters are working to strengthen containment lines around the blaze, which broke out yesterday afternoon. "The fire is burning within containment lines and there is no threat to property at this time," the Queensland Fire and Emergency Service said in an advice posted today at 6.30am. "Firefighters will continue to monitor conditions throughout the morning and ask that residents remain vigilant and up-to-date with information." A significant smoke haze continues to affect the area and surrounds and residents are asked to close windows and doors and keep medications close by if suffering a respiratory condition. Smoke can also decrease visibility on the roads and motorists are asked to drive with caution and to conditions. A temporary place of shelter at Lake Kawana Community Centre is now closed. Affected residents were told just after 10pm yesterday they could return to their homes as fire activity eased and the Public Safety Preservation Act was revoked by Queensland Police. The shelter provided safe place for up to 45 residents and visitors during the fire emergency. Mayor Mark Jamieson thanked the community for their co-operation. "The most important outcome is that no injuries have been reported, no properties were damaged, and that the residents who were affected are now home safely," Mayor Jamieson said. "Our thanks go to the emergency services for their outstanding work protecting our community." A second fire which was burning near McCords Road, Yandina Creek last night has now also been contained and there is no threat to homes at this time. Crews will continue to monitor the area throughout the morning. EARLIER: FIREFIGHTERS will continue battling a blaze which saw homes evacuated at Caloundra South, Little Mountain and Bellvista late yesterday. Late last night, Queensland Police revoked its emergency situation declaration under the Public Safety Preservation Act for the bushfire. 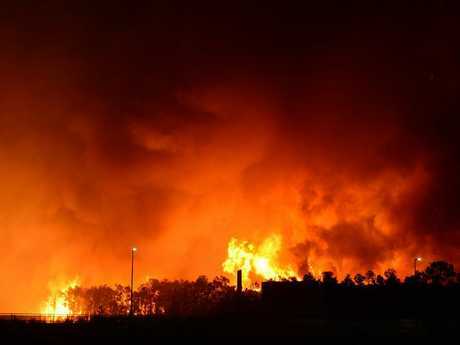 Residents were told just after 10pm they could return to their homes. Multiple fire crews are expected remain on site near Bells Creek Arterial Rd, Bellvista and Little Mountain on Saturday, creating firebreaks and undertaking backburning, as they continue to work through the night to seize control of the fire. With strong winds continuing, residents are being urged to maintain an active watch. The large grass fire broke out around 1.30pm on Friday, forcing major disruptions on the Bruce Highway. A second fire was also burning near McCords Road, Yandina Creek last night. "There is no threat to homes at this time and firefighters are working to contain the blaze,'' the Queensland Fire and Emergency Service said in an advice posted at 7.30pm. "Residents in the surrounding areas should close windows and doors and keep medications close by if suffering from a respiratory condition." UPDATE 9.45PM: A Queensland Fire and Emergency Service spokesman says the threat has lessened slightly for homes and residents around Bells Creek Arterial Rd, Bellvista and Little Mountain, but crews are still working to bring the fire under control. Firefighters are at the mercy of the wind, which was tipped to swing around at about 9pm. The bulk of the crews are working close to properties around those areas aforementioned, in a bid to bring the fire under control before daybreak, as tomorrow's conditions loom as a challenge. Weatherzone is forecasting south-westerly winds of up to 39km/h tomorrow, which could prove challenging for firies who have so far preserved life and property. UPDATE 8.45PM: Firefighters are battling hard to control the fire with most crews focused on homes around Bellvista and Little Mountain, ahead of a wind change expected at about 9pm which could have a massive impact on the situation. There are 30 crews battling the blaze, and their equipment and personnel are focused on the area around Bells Creek Arterial Rd, near Koala Crt and Adelaide Cct and Bellvista, to protect homes and lives. A wind shift is expected to sweep through at about 9pm and it could have a significant bearing on the situation, with crews focused on the area and remaining there to see what impact the wind change will have. Meanwhile the threat has been downgraded slightly for those homes, with residents in the area advised to take precautionary actions, including protective clothing, drinking water and preparing resources to fight the fire and protect your property, if you've chosen to stay. UPDATE 8.30PM: A SMALL number of families have settled in at Lake Kawana Community Centre while taking refuge from the Caloundra South fire. Sunshine Coast Councillor Rick Baberowski said residents would probably be more comfortable staying with family and friends but urged anyone without that option to come to the centre. Cr Baberowski said there were about 25 people, who had left their homes, waiting at the centre. "The staff are trying to make sure they have plenty of food and tea," Cr Baberowski said. He said the people were concerned but upbeat. "They are taking it with very good spirits." MAJOR ALERT 7.20PM: Bellvista residents have been told to evacuate their homes now, as the bushfire has jumped Bells Creek Arterial Rd and is making its way towards homes around Koala Crt and Adeladie Cct, Little Mountain. The large fire is expected to hit those areas in the next 10 minutes. Firies advise the fire is moving quickly and is out of control, despite more than 30 crews fighting the blaze. 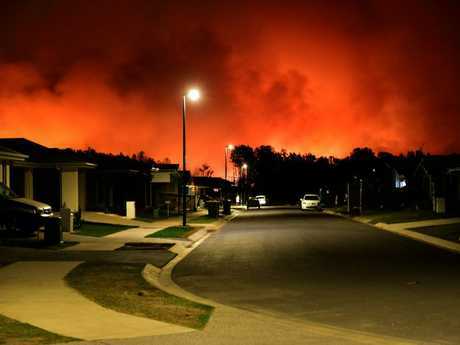 UPDATE 7PM: Residents are making the gut-wrenching call of whether to stay or go, as evacuations are called for in Caloundra South's Aura estate, and now some Little Mountain streets. 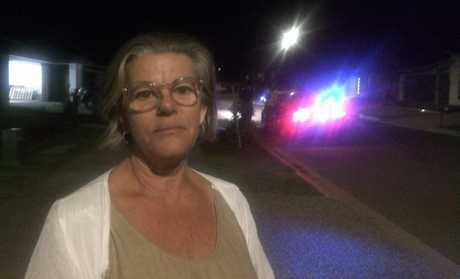 Caloundra South resident Pru Schalkwyk was leaving her Agnew Crt home, police advising her embers had jumped Bells Creek Arterial Rd and there was a change of wind expected. "We were waiting but the police have just come now and we all have to get out," she said. She said nearby horses were still being evacuated, and with her husband away, she'd decided to bail out and get to a friend's home at Wurtulla. "It is scary," she said. "I'm very concerned with the amount of bushfires and just with these winds, how quickly it took off." She said it was "unbelievably warm and scary" so it was "time to go". Meanwhile nearby resident Nev Cahill said he was not as concerned as he'd been earlier, as the winds were blowing in the opposite direction of his Rosseau St home. He was meant to have his sons at home tonight, but had arranged for them to stay elsewhere, as he'd seen the smoke plumes on his way home from Nambour earlier. "I've never seen smoke like this," he said. "There's fire trucks going up and down Bells Creek Arterial Rd. "Probably most of the people have gone, but only in the last 10 minutes. I've never seen anything like it." Police have just called for residents of nearby Koala Crt and Adelaide Crt in Little Mountain to also evacuate, advising them to head to an evacuation centre at Lake Kawana Community Centre, at 114 Sportsman Pde, Bokarina. Southbound lanes of Bruce Hwy traffic between the Coast and Brisbane are reduced to one lane about 2km south of the Caloundra exit. Northbound lanes are travelling slowly from Roy's Rd to that same spot as motorists slow to look at flames. UPDATE 6.30PM: QUEENSLAND Fire and Emergency Services Deputy Commissioner Mark Roche has addressed the media in relation to the uncontained Meridan Plains bush fire. Dep Comm Roche said crews did not yet have control of the incident, but the southern end of the blaze was contained. Crews are now working to contain the north-east barrier of the fire which is being impacted by strong winds. About 80 firefighters remain on scene along with council, police and ambulance services according to Dep Comm Roche, who said crews stay put into the night. He urged residents to leave their homes if necessary and move to the evacuation centre set up the Kawana Community Centre. There has been no structural damage caused by the fire so far. Dep Comm Roche urged people to avoid "rubber necking" and clogging up the already congested Bruce Hwy as people evacuated their homes. UPDATE 5.50PM: Police have declared an emergency situation under the Public Safety Preservation Act, as an intense fire makes its way towards Caloundra South's Aura Estate. The declaration was made for the estate, with boundaries encompassing Caloundra Rd to the north, Lamera Creek Rd to the south, Bellvista Blvd to the east and Racecourse Rd to the west. Police reported that many residents and businesses in Aura Estate had evacuated to family or friends places, while police were continuing to contact local. An evacuation centre has been set up at the Lake Kawana Community Centre, at 114 Sportsman Pde, Bokarina. The Sunshine Coast Council said more than 35 fire service appliances were on scene taking preventative actions, and no property or lives were threatened at this stage. There are about 75 families living in the Aura Estate. UPDATE 5PM: Aerial waterbombers will only have about an hour of daylight left to battle a blaze ripping its way towards homes at Meridan Plains. 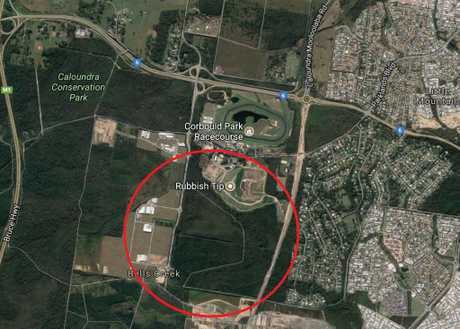 McDermott Aviation's Simon McDermott said the two choppers were currently drawing water from Corbould Park Racecourse and targeting land to the south of the race track. Firefighters will be hoping the strong winds ease as nightfall comes, with residents of Caloundra South, in Stockland's Aura estate advised to evacuate or prepare to enact their bushfire survival plans. A Stockland spokeswoman advised residents and visitors in the area to closely monitor and follow instructions from emergency services. "Safety is always our first priority and we work closely with relevant authorities on our bushfire management plans and encourage all our residents to have up to date fire management plans in place," the spokeswoman said. 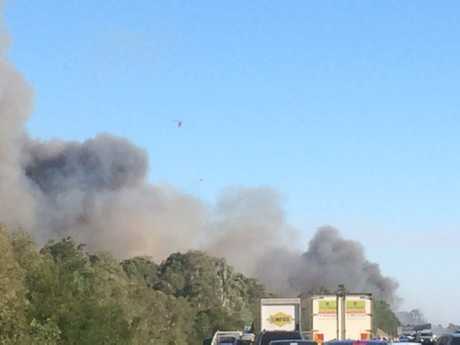 UPDATE 4.30PM: Witnesses have described the intensity of seeing "seven-storey" high fireballs erupt after a fire was sparked alongside the Bruce Hwy this afternoon. Brendan West described it as the "most intense" grassfire he'd ever seen on the Sunshine Coast. He noticed smoke coming from his backyard, and moments later a devastating bushfire was ripping its way towards residents of Caloundra South. "It went up so quick," he said. He estimated 15-20 fire trucks sped past him to fight the fire, battling strong winds fanning the flames. "There was fireball after fireball about seven storeys high," Mr West said. Out of control fire at Bruce Hwy: Video sent in by Dan Blunden. "Hopefully they get it under control." Firefighters are continuing to advise Caloundra South (Aura) residents to evacuate their homes, or prepare to enact their bushfire survival plans. The blaze is burning quickly in an east/north-easterly direction, after sparking up alongside the Bruce Hwy at Meridan Plains just before 2pm. The fire remains out of control, as at least 19 fire crews battle to gain the ascendancy. Two McDermott Aviation waterbombing aircraft have been called in to help fight the fire. A Queensland Fire and Emergency Service spokesman said there had been no reported loss of property as yet. UPDATE 4PM: Waterbombing aircraft have been called in to fight the fast-moving fire ripping through bushland alongside the Bruce Hwy this afternoon. The Meridan Plains firefront is moving quickly to the east, with Aura Caloundra South residents being told to evacuate, or enact their bushfire survival plans, while nearby businesses are being evacuated, as 10 fire crews battle the blaze. Bruce Highway traffic is crawling southbound, with smoke hazards in the area. UPDATE 3.30PM: Firefighters are advising residents of the Aura Caloundra South development to evacuate, or enact their bushfire survival plans. The firefront is moving rapidly east, after the blaze sparked alongside the Bruce Hwy, and spot fires are being sparked up to 4km ahead of the firefront. Firefighters say they expect the fire to impact on Aura estate. "The fire is expected to impact on the Aura community and some property may be lost," the firefighters' alert reads. "Residents are strongly advised to leave now if they are able to do so. Leaving is the safest option for survival." The Daily's photographer, John McCutcheon is on the scene and says police are frantically telling businesses within the Sunshine Coast Industrial Park to evacuate. Traffic congestion is building along nearby roads, as the blaze continues to burn, and 10 firefighting crews are struggling to contain the fire. Sunshine Coast Turf Club staff reported thick smoke in the area, but said they were still some distance from the fire. NINE fire crews are currently battling to control a massive fire which has sparked up next to the Bruce Highway. Firies were alerted to the blaze just before 2pm and nine crews are currently working on the blaze which a QFES spokesman said had spread to both sides of the highway. The Department of Transport and Main Roads is warning of a fire hazard on the Bruce Hwy south of the Caloundra rd exit, with southbound traffic possibly affected due to thick smoke. The spokesman said it started as a grassfire next to the highway, and had spread quickly. Crews were working to section the fire and control it, and it was unclear how it had started at this stage. The spokesman said there appeared no threat to property at this stage, but witnesses on the scene near the Sunshine Coast Turf Club feared the blaze was closing in on local businesses. "I've never seen anything like this," Brendan West said.